First On Stage - A collection of historical firsts in American musical theatre. Years ago, while teaching college courses in the History of American Musical Theatre, my research exposed numerous instances of innovation in the art form (“this was the first time…”) as theatrical technologies, along with musical styles and forms, evolved. I began to “collect” such phrases, which later included people, theatrical venues and other occasional oddities, into the collection and organized the data chronologically. At this site, we focus on historical firsts. Innovation creates history, and this is a collection of innovative events, decisions and inventions. Among other things, the collection includes initial appearances of popular shows, songs and performers. Here, you’ll find descriptions of theatrical firsts in America from 1665 to 2000. Each “historical first” appears in bold type. Generally, the New York opening is considered the finished form of any work (even if subsequent changes occur during the New York run). For the sake of maintaining some historical perspective, this site covers events through the 1999-2000 season. Ongoing additions to the site include textual entries and pictures of people and theatrical venues. One project will soon offer links to audio files of songs in the public domain; other improvements may occur as they are invented or suggested. We owe much to those who have assisted in the development and presentation of this material. Please see our “Cast & Crew” page. To everyone who appears there, I offer my deepest thanks. Perhaps you will find something here that will initiate your own research. You might want to have an item considered for inclusion at the site (if so, please contact me). You might wish to correct an error that you find here (if so, by all means contact me). You may even find items that will pique your curiosity and motivate you to seek answers. We hope that this site will bring you closer to the theatrical art form that has proven time and again to be our most beloved: the musical. Thank you for visiting FirstOnStage.com, a web site that was literally decades in the making. We hope you find the information here useful in your classes, in your research or in exercising your intellectual curiosity. If so, we hope you’ll make a donation to help support FirstOnStage. This information comes to you quickly and easily without the cost of expensive textbooks or hours of searching for the proverbial needle in the digital haystack. Your gift will enable site developers to provide ongoing enhancements, including additional textual content, pictures and audio files. PayPal will safely and securely process the transaction. Thanks for your interest and your generous support! The first Gilbert and Sullivan performance in America took place in Boston on November 25, 1878. The first New York performance was January 15, 1879. The show, H.M.S. Pinafore, went from Boston to San Francisco and then Philadelphia before appearing in New York. By early May, no less than eleven major theatres in New York had hosted the work. Here was musical theatre that integrated dialogue, music and lyrics cohesively. This work by two Englishmen strongly influenced the development of American musical theatre. Pinafore had a tremendous impact on American producers, lyricists and composers, who had been awakened to the possibilities of their art form. 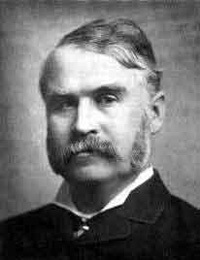 William Gilbert (1836 - 1911), a lawyer-turned-lyricist, and Arthur Sullivan (1842 - 1900), a successful British composer, partnered for the first time in 1871 to create a musical entertainment called Thespis. The piece, which Gilbert himself called "crude and ineffective," sufficiently impressed Richard D'Oyly Carte, who commissioned the pair to write Trial By Jury four years later. The success of that show led to many others. D'Oyly Carte eventually built a theatre, The Savoy, to house the shows in London. Ladies and gentlemen, this first selection was randomly generated for your edification and delight!